2 YRS Suzhou Octoparts Nano Technology Co., Ltd. Heating coils are located directly inside the pan for the most efficient heating possible. 3. Vacuum transfer valve can collect continuously without affecting system vacuum and solvent distillation. Easy rubber seal used in all new national standard, user-friendly purchasing replacement. 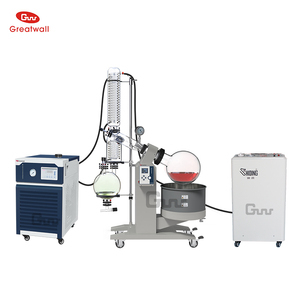 The evaporation rate is regulated by the heating bath temperature, the size of flask, the pressure of distillation and the speed of rotation. 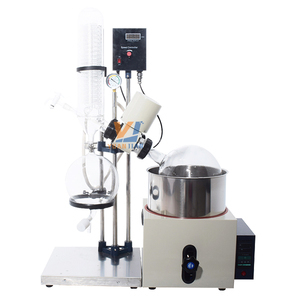 Advantages of the rotary evaporator(compared with static apparatus):With a vacuum rotary evaporator you can carry out single-stage distillation runs quickly and gently. We work hard to provide high quality and low cost laboratory products to our customers in universities, research labs and production facilities. 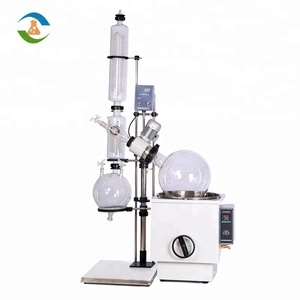 1 YRS Anhui Puli Instrument & Apparatus Technology Co., Ltd.
RRE20V2 20L Vacuum Distillation Rotary Evaporator with Supporting Chiller A rotary evaporator is a device used in chemical laboratories for the efficient and gentle removal of solvents from samples by evaporation. 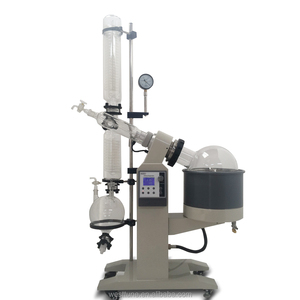 The process of rotary evaporation is most often used to separate solvents with low boiling points, such a n-hexane or ethyl acetate, from compounds which are solid at room temperature and pressure. 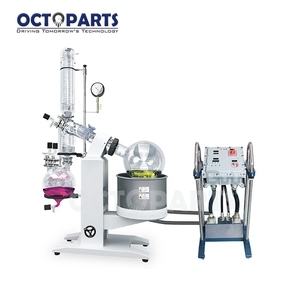 , Ltd, Main category of Green Distillation covers Rotary Evaporator, Short Path Distillation equipment, Molecular Distillation System, Chemical Reactors, Vacuum Filtration System read more. 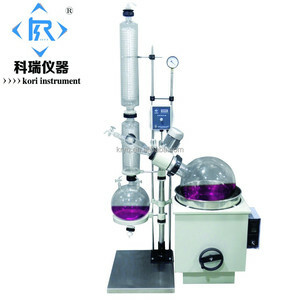 RE-5210A 10L Rotary Evaporator Description of RE-5210A 10L r otary evaporator Rotary Evaporator is the use of vacuum pressure, constant temperature heating conditions, using the rotating bottle constant speed rotation, the formation of large area thin film, high evaporation equipment installations. 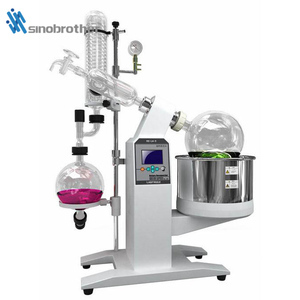 Features of RE-5210A 10L series rotary evaporator 1. Built-in vacuum controller, High vacuum performance 2. PTFE sealing 3. Automatically adjust the ascending or descending of rotary flask 4. Digital display and control 5. Easy assembling design: to be assembled within 30 minutes. 3. 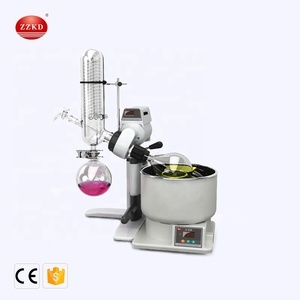 What can do with the rotary evaporator9 Mainly Vacuum distillation 4. Can you offer the supporting facilities9 Yes, we can offer you the vacuum pump, heating and cooling system as you demand. Features &bull; The main bracket is made of stainless steel and aluminum alloy with reasonable structure and materials. &bull; Anti-dry function, the heating pot lower than the heating pipe, the machine will automatically power off. &bull; If there is a sudden power failure while the machine is working, the machine will stop heating automatically when the power is turned on again. 6 YRS Foshan City Nan Tai Metal Co., Ltd. It can be widely used in refrigeration, air conditioning, sea water, steam, oil pressure, pharmaceutical and other fields, which are safety and durable. We can produce according your drawing, we also can design according to your request. This Heat Pump Heat Exchanger (coaxial heat exchanger) is very popular in the application of salty pool heat pump. 8, bath pot digital display, intelligent constant temperature control, K type sensor fast and accurate delivery temperature. bath pot digital display, intelligent constant temperature control, sensor fast and accurate delivery temperature. Due to the existence of thermal inertia, the actual water temperature is about 2 degrees higher than the set temperature. &#9679; control, temperature part: the introduction of foreign advanced frequency control system, temperature control system to ensure the accuracy of the instrument. 2.2 The introduction of foreign advanced frequency control system, temperature control system, accurate and reliable. 3.By sea Port to port and you need to do the customs clearance and pick-up the goods at your local port, which you can have a local shipping agent to do for you. 11 YRS Zhejiang Taikang Evaporator Co., Ltd.
Alibaba.com offers 4,046 water chiller evaporator products. About 13% of these are heat exchanger, 7% are evaporator, and 5% are refrigeration & heat exchange parts. A wide variety of water chiller evaporator options are available to you, such as rohs, ce, and ul. You can also choose from evaporator, refrigeration compressor, and heat exchanger tube. As well as from refrigeration parts, heater parts. And whether water chiller evaporator is free samples, or paid samples. There are 4,046 water chiller evaporator suppliers, mainly located in Asia. The top supplying country is China (Mainland), which supply 100% of water chiller evaporator respectively. Water chiller evaporator products are most popular in Domestic Market, Southeast Asia, and North America. You can ensure product safety by selecting from certified suppliers, including 2,148 with ISO9001, 873 with Other, and 489 with ISO14001 certification.